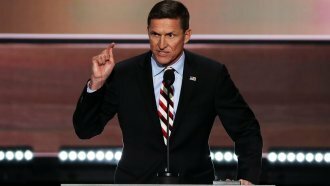 Michael Flynn's family says he needs help footing legal defense bills that could reach $1 million. Former national security adviser Michael Flynn's siblings are trying to drum up donations to pay for his legal defense. Bloomberg reported that Flynn may have been thinking about fundraising back in July, citing the possibility of criminal defense fees getting as high as $1 million. Flynn's family set up a website to accept donations toward his legal fees associated with the multiple Russia investigations. The site calls the cost a "great burden." How much of a burden isn't clear. Flynn made about $1.4 million for lobbying, speeches and other work last year, according to an April filing he made with the White House. Investigators are looking into a range of issues, including whether or not Flynn misled officials about his work as a foreign agent and if he needed to disclose payments he received from foreign nationals. The site says donations from foreign nationals will not be accepted. Multiple outlets, citing sources close to the fund, also say it won't accept donations from President Donald Trump, his campaign or his companies.